We believe that authentic organizations are energetically held together through the Law of Love. When this Law is fully active, its members are interconnected, operating in integrity, and experiencing peace, harmony, and understanding in all of the organization’s activities. The members of an authentic organizations are able to give and receive unconditional love, even in challenging situations involving intractable conflicts. The individuals, couples, families inside large organizations are able to evolve. This is the underlying principle of LOVEvolution. Large organizations–schools, churches, small businesses, corporations, and non-profits–are alive, dynamic, living organisms that have a life of their own and evolve in their own unique way. They need to be fed, nourished, and engaged with in order to grow, change, and mature over time. Understanding and recognizing the “aliveness” of large organizations requires being able to observe their dynamics, while also being inside them and experiencing them personally. We discovered that this can be a complex process. Authentic large organizations recognize that their members bring with them their unhealed developmental trauma and incomplete developmental processes. They also recognize that both are actively searching for people and situations to help them heal and complete their development. Large organizations typically contain hierarchies of power, authority, and responsibility that naturally recreate parent-child relational dynamics. Bosses are perceived as parents and members regress into passive, compliant child behavior patterns. It is exactly these family patterns that activate Drama Triangle dynamics and the unresolved conflicts associated with them. It is the fact that there are two realities happening simultaneously that creates the complexity in large organizations! For these reasons, it is important that authentic large organization establish effective ways for employees to resolve their present-time conflicts. Authentic large organizations provide conflict resolution training for all members. While most organizations do not have this in place, quantum theory and chaos theory suggest that these invisible interpersonal dynamics have great influence in how well the organization operates and evolves. As part of our research, we applied our four-stage developmental model to these large organizations, and identified the developmental process that they must successfully complete in order to become “authentic. Our research consisted primarily of working with members’ work-related conflicts that contained unrecognized and unhealed developmental traumas. Work-related conflicts are complex because people unconsciously bring their personal unhealed developmental traumas to work with them every day. 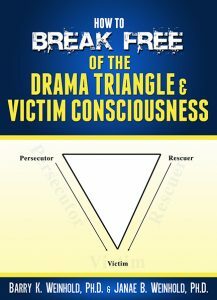 These traumas create Drama Triangle dynamics that show up during workplace conflicts. When person overreacts during a workplace conflict, it is likely that they are reenacting unhealed trauma from their family of origin. Unfortunately, most people are totally unaware of this replay and why they are so upset. Rather than judging or criticizing co-workers who overreact to situations in the workplace, it is important to look beyond the conflict and respond to them with understanding, compassion, and empathy. The recognition that their behavior comes from some earlier unresolved conflict or unhealed developmental trauma can keep the situation diffused and contained. If you over-react to a conflict situation, it’s important to offer this acceptance and compassion to yourself. What Blocks the Evolution of Large Organizations? There are many factors cause large organizations become stagnate and fail to evolve. One of them is a rigid organizational structure that often makes it difficult for members to acknowledge their traumas and resolve their present-time conflicts at work. Most of them consist of formal networks of horizontal and vertical structures that are designed to accomplish the primary goal of the organization: providing some function or service that makes money. Unresolved conflicts and unhealed traumas can affect the morale, productivity, and wellness of an organization. Typically there are no formal or informal policies in place to address workplace conflicts, other than reporting them to HR. In most large organizations, even this process is fraught with problems. Ostensibly, a Human Relations employee is just that: an employee of the organization. It’s not reasonable to expect them be totally neutral in a grievance against the organization by an employee. Unions used to perform this function, albeit, not always very well, but they have almost disappeared in most large organizations. When people work closely together for a period of time, unresolved conflicts and unhealed developmental traumas from their families of origin will begin to surface. 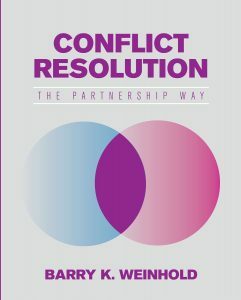 Barry has a chapter about how to resolve conflicts in organizations in the 3rd Edition of Conflict Resolution: The Partnership Way.